Simple things also can't get right. Govt boards & related companies very often choose the cheapest bid. Well the cheapest turn out to be not so cheap in terms of fixes to rectify the errors & lost productivity. Extra hours worked - very hardworking indeed! The first spelling mistake to catch my attention was the Xmas & New Year banner which surfaced online last year. It led people to wonder what kind of cheap foreign worker the winning bidder employed? Such a simple word that even a sinkie with primary school education would know the correct word is Merry. We can see that nobody cares. No checking as it goes to the printers to the people putting up the banner. Bochup, bochup, bochup is the order of the day. Then we have the opening of the S$1.87B national stadium. The hugely expensive stadium though expensive is likely to be won by the cheapest bidder as is often the case for govt-contracts. New stadium was plagued with grass problem & a leaking roof. Again what kind of advertising message being sent to the outside world? Then i have my own experience of seeing it with my own eyes as i go to the National Museum after the Philatelic museum since they are close to each other. It was reported last year around the opening of the exhibition that Showcase of S'pore history marred by typos, errors. Perak's Slim River appearing as "Grim River"
Singapore Symphony Orchestra as "Singapore Symphonic Orchestra". Again the workers involved such as museum staff, printers, setting up etc are bochup, bochup & bochup. There's something wrong with the management as the staff are 'bochup'. It took a Briton visiting the museum to point out the mistakes. 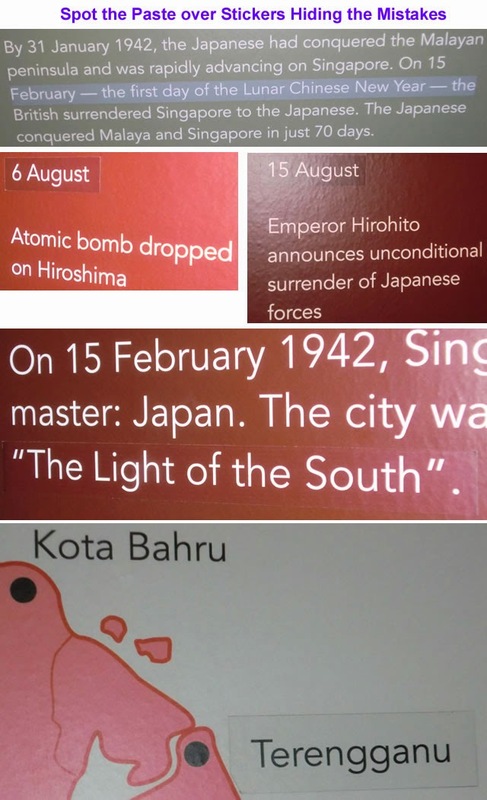 These mistakes are spotted at the WWII section of SG700 years exhibition at the museum. I may have missed out the pasted over corrections at the earlier periods as i walked through the exhibits corridor but the WWII section sounded the alarms for me. What do these mistakes tell you? Well it tell me it is highly likely to be done by a foreign worker. How likely is a sinkie not to know this easy to remember fact? Alarm bell - likely done by a foreigner. 1st atomic bomb is 3 days before Nagasaki bombing on the 9th which is SG's national day. Pretty easy to remember. 6 Aug - Hiroshima atomic bomb. Easy reference using SG national day & mistake made. Alarm bell - likely done by a foreigner. Japanese emperor announces surrender. Ok i don't remember this date. With wikipedia today, the fact can be easily obtained without the outdated memorizing approach still taught in schools. Bochup, bochup, bochup. Didn't bother to check date of surrender. Likelihood is that sinkies would know that SG is renamed Syonan To, the japanese word for 'The Light of the South' in history classes in compulsory secondary school. Alarm bell - likely done by a foreigner. Ok we can sort of rule out malaysian workers as how can they don't know how to write their 'Terengganu' state. With the clues of these pasted over corrections, i would deduce that the work is done by a non-sinkie & non-msian. This kind of work can't be done by a sinkie being paid decent wages? Must rely on cheaper foreign worker & end up spending more to fix & time wasted? How to inspire confidence with these kind of advertising to foreign investors, tourists & locals with the way the current hybrid regime is doing things? "How to inspire confidence with these kind of advertising to foreign investors, tourists & locals with the way the current hybrid regime is doing things?" Doesn't matter lah, so long as PAP is confident that in a General Election, 60% Sinkies are very scared to accidentally vote PAP out because the strongest opposition party, the WP, is not ready to be govt.